Little Fish tells the story of a baby fish searching for his mother. On the way, he encounters various underwater animals, each of a different colour. 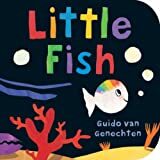 Little Fish meets everything from a red crab to a blue whale. In a style reminiscent of Eric Carle, these bold, collage-style images are highly attractive for younger readers. The use of two-dimensional colour planes ensures high contrasts between the images and the black background.